The 1987 solved homicide of Judith Whitney. Judith Whitney, age 43, of Amherst, MA, was last seen on the afternoon of July 2, 1987. She had spent the night of July 1st to 2nd, 1987 at the Valley Green Motel in Keene, NH. A chambermaid saw Judith that afternoon. That same witness saw Edward Mayrand driving Judith's 1980 Ford Mustang the following day, on July 3, 1987. 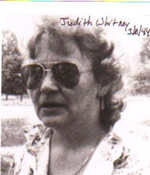 Judith was reported missing by her brother and ex-husband on July 20, 1987. Judith's skeletal remains were found in a wooded area off of Route 119 in Winchester, NH, on November 8, 1987. Judith's death was ruled a homicide. Edward Mayrand is the prime suspect in Judith's murder.